The ocean is full of colorful reef fish and intricately designed tiny critters, but it’s hard to beat coming face to face with a giant. Whether you’re shooting a toothy great white shark or a pod of playful dolphins, big animal underwater photography can be hugely rewarding. But photographing big animals can also be extremely challenging. You have to know the right location, the right time of year, and the right operator to get your camera’s lens as close to the big boys and girls as possible. That’s why we’ve created the Ultimate Guide to Big Animal Underwater Photography. This evolving guide now features 45 of the most-desired big animal destinations around the world. We’ve collected the best places to visit for the greatest chances of a memorable big animal experience, helping you check off your photography wish list. 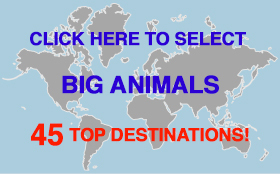 The guide is organized on an interactive map, where you can browse subject by destination, or you can go directly to the animals via the left-hand menu or the linked thumbnails below. Each big animal destination features practical information for the best possible encounter, along with tips from top professional underwater photographers to help you nail the shot.